JOCKO WILLINK is author of Extreme Ownership, a decorated retired Navy SEAL officer, and co-founder of Echelon Front, where he is a leadership instructor, speaker, and executive coach. Jocko spent 20 years in the U.S. Navy SEAL Teams, starting as an enlisted SEAL and rising through the ranks to become a SEAL officer. As commander of SEAL Team Three's Task Unit Bruiser during the battle of Ramadi, he orchestrated SEAL operations that helped the "Ready First" Brigade of the US Army's First Armored Division bring stability to the violent, war-torn city. Task Unit Bruiser became the most highly decorated Special Operations Unit of the Iraq War. Jocko returned from Iraq to serve as Officer-in-Charge of training for all West Coast SEAL Teams. There, he spearheaded the development of leadership training and personally instructed and mentored the next generation of SEAL leaders who have continued to perform with great success on the battlefield. During his career, Jocko was awarded the Silver Star, the Bronze Star, and numerous other personal and unit awards. In 2010, Jocko retired from the Navy and launched Echelon Front where he teaches the leadership principles he learned on the battlefield to help others lead and win. Clients include individuals, teams, companies, and organizations across a wide-range of industries and fields. 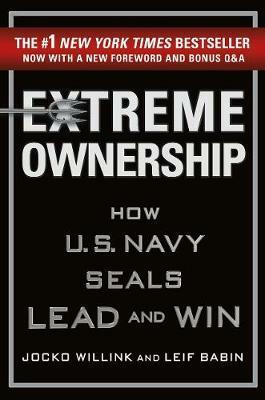 Jocko is also the author of the children's book Way of the Warrior Kid and the New York Times bestseller Discipline Equals Freedom.LEIF BABIN is author of Extreme Ownership, a decorated former Navy SEAL officer, and co-founder of Echelon Front, where he serves as leadership instructor, speaker, and executive coach. A graduate of the U.S. Naval Academy, Leif served thirteen years in the Navy, including nine as a Navy SEAL. As a SEAL platoon commander in SEAL Team Three's Task Unit Bruiser, he planned and led major combat operations in the Battle of Ramadi that helped the "Ready First" Brigade of the US Army's 1st Armored Division bring stability to the violent, war-torn city. Task Unit Bruiser became the most highly decorated special operations unit of the Iraq War. Leif returned from combat as the primary leadership instructor for all officers graduating from the SEAL training pipeline. There, he reshaped SEAL leadership training to better prepare SEAL officers for the immense challenges of combat. During his last tour, Leif served as Operations Officer and Executive Officer at a SEAL Team where he again deployed to Iraq with a Special Operations Task Force. He is the recipient of the Silver Star, two Bronze Stars, and a Purple Heart. In 2011, Leif left active duty and co-founded Echelon Front, a leadership consulting company that helps others build their own high-performance winning teams. Clients include individuals, companies, and organizations across a wide-range of industries. Leif speaks on leadership, U.S. military strategy, and foreign policy matters. His editorials have been published in the Wall Street Journal and he has appeared on a variety of national television news and radio programs.